I have received product from Jonathan Louis in exchange for this post. All expressed opinions are 100% my own. Small spaces can be some of the hardest to decorate. My living room has driven me all levels of crazy ever since we moved into this home in 2010 because of its awkward layout and small size. I am constantly rearranging pieces and swapping things in and out trying to find the solution to the design dilemma it poses. Providing extra seating has been the trickiest problem for me. I can get a couch in here, but beyond that, I haven’t known what to do. This has been the situation for several months, and today I am excited to share the perfect solution I found! 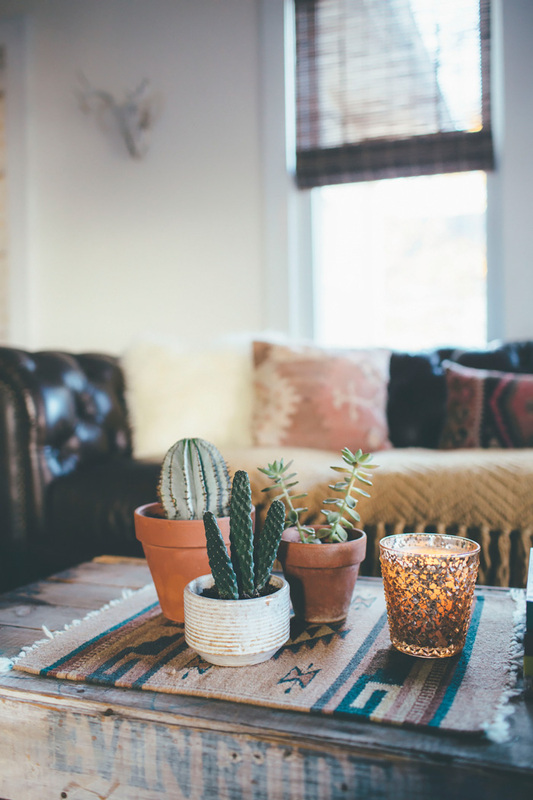 When Joshua and I got married and were making our home together in a one bedroom apartment, I struggled with knowing how to pull it together for both of us and make it comfortable for guests. I only cared about form back then and purchasing vintage. 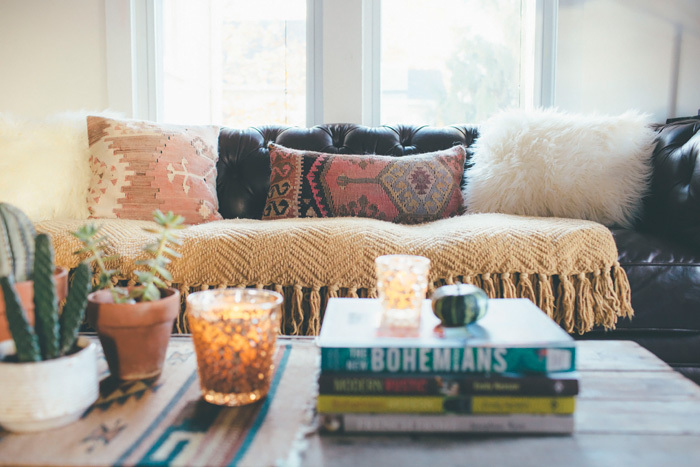 Our first living room was a hot mess of hand me downs and thrifted finds with a dilapidated, dark green wicker love seat taking center stage. When people would sit on it, green paint chips would fall all over the carpet, so I was constantly vacuuming after anyone dared take a seat. It wasn’t until we purchased this home that we decided to venture into a furniture store for the first time to buy something brand new. My thought was that I wouldn’t be able to find “new” pieces that fit my style. I assumed they would all be beautiful to look at but not comfortable or quite the opposite: really comfortable with no style whatsoever. So not true. It has taken some time, but through the years I have learned to bridge the gap between form and function and create a space that is warm, inviting and true to my style. After choosing a sofa for our current living room arrangement, I have still struggled with what to place opposite of it. The room is oddly shaped to start: it’s more of a square than rectangle with doorways or windows on every wall. The front door opens directly into it, so the walking path needs to stay somewhat clear. I have left the space opposite the sofa empty forever, not knowing what to do. How could I possibly find something to make this room comfortable, stylish and work in this awkward space? 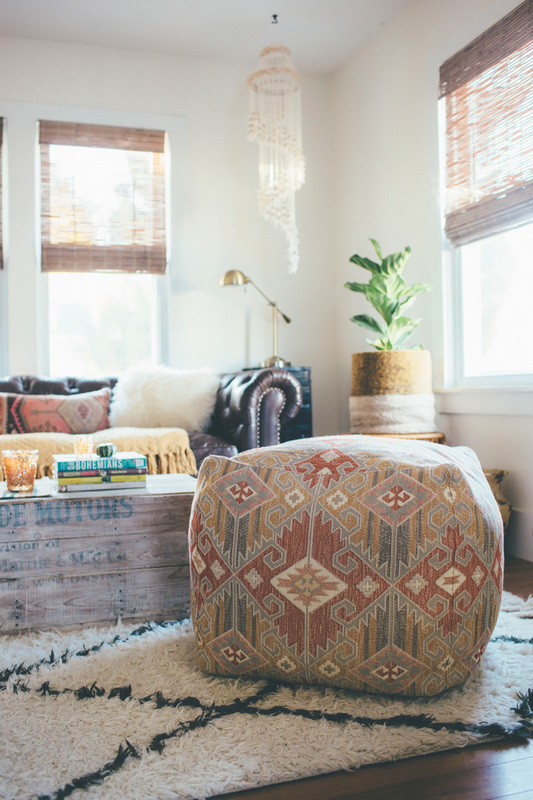 Our living room is on the casual side with a rustic, bohemian style, so finding something that fit that vibe was ideal. A pair of chairs seems like a good design idea, but for the life of me, I could not figure out a way to make it work that didn’t disrupt the natural flow of the room. While browsing accent pieces by Jonathan Louis, I spotted the Evan Pouf Ottoman. I have been dreaming of some cool ottomans for awhile. The dimensions of this particular one are taller than a foot rest ottoman, which made me realize it could be the answer to my dilemma. A pair seemed like the best idea because they could be placed across from the couch to offer additional seating and give me the look I was going for to finish off the space. They are soft and comfortable making them perfect for lounging or using as a traditional ottoman. 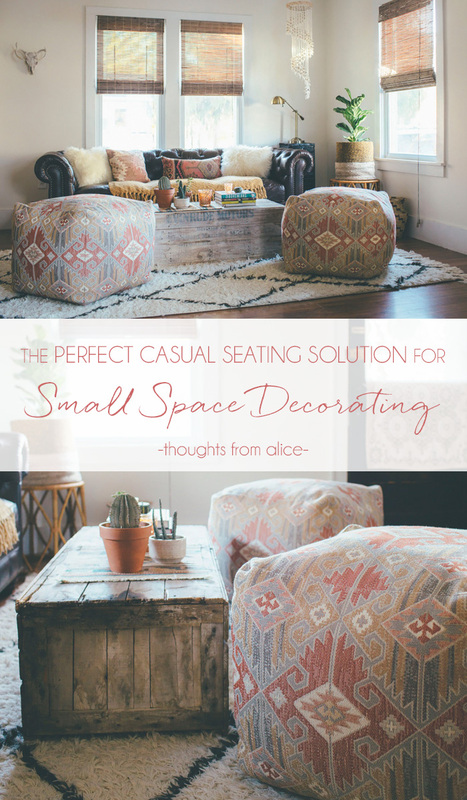 They can also easily be moved out of the way when needed, making them ideal for this small space. My favorite part about these ottomans is that they are available in a variety of different fabrics. 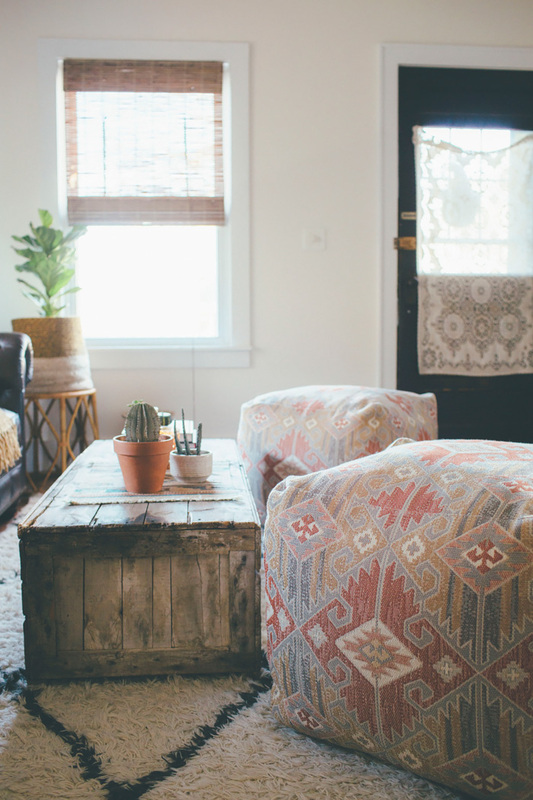 I ordered three swatches and decided on one that fit our living room’s eclectic bohemian style called, “Mesilla Sunset.” The colors blend in perfectly with the other pieces in the room and I love the extra layer they bring to the room with their pattern and texture. Problem finally solved…form meets function in our living room! These ottomans are definitely high quality and I can tell by the construction they are made to last. Something our first furniture pieces could not boast. The Jonathan Louis brand not only offers pouf ottomans but also beautiful sectionals, sofas, swivel chairs, armchairs, other accent chairs, storage benches, storage and cocktail ottomans, headboards and lots more. 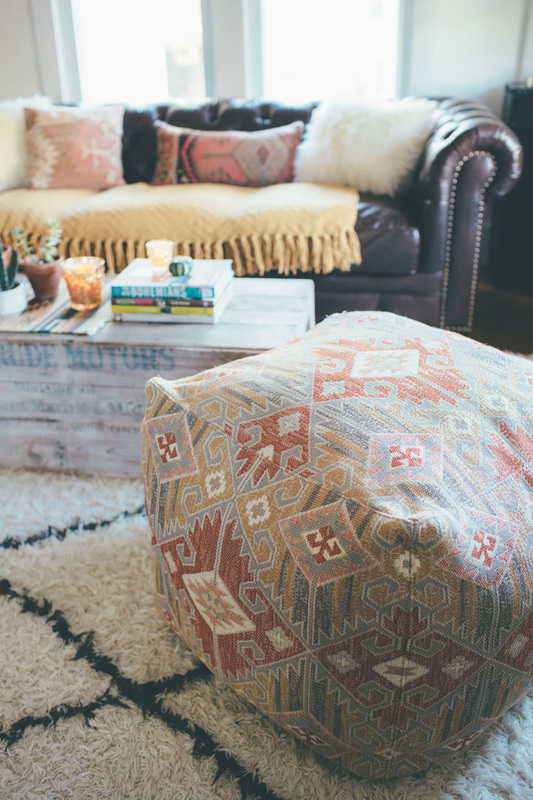 I am really thrilled with how this room has come together with these two pouf ottomans, and I’m so glad that I no longer have furniture I have to vacuum up after anymore like those early days. If you are just starting out as newlyweds or first time home buyers, don’t be hesitant to invest in high quality furniture for your home. Looking back, I know we should have taken the plunge much sooner! Most everything else are thrift store scores and/or one of a kind finds! Click here to see more from our living room in previous posts! I once lived in a place only 450 square feet–that is small! It was extremely difficult to find scaled down stuff to use! The room looks great, they really do fit in perfectly!! These are really cute and they go with your style. Thumb up from me! I've been looking for a rug like yours—they are SO expensive. And tips on where to look? Thank you Jane! I got ours from RugsUSA…they have sales all the time! Try for a time when it's marked down a lot! Really gorgeous room. 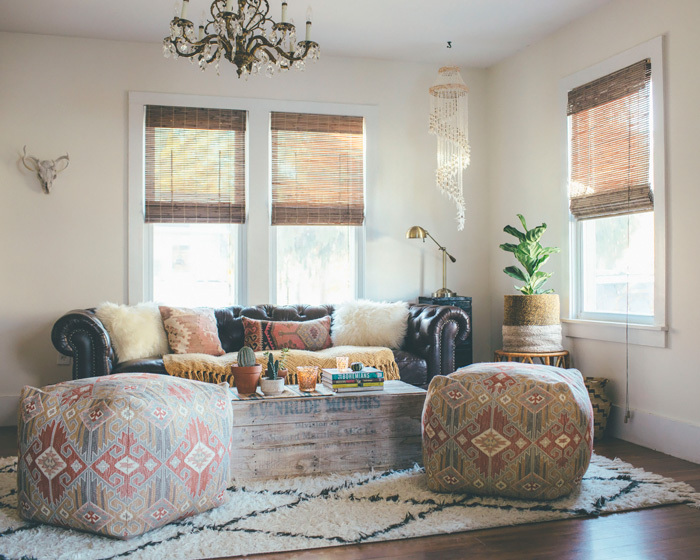 I'm liking very much the rustic BoHo vibe you've got going there, and the eclectic, slightly southwestern look to the ottomans really ties it all up with a raffia bow! 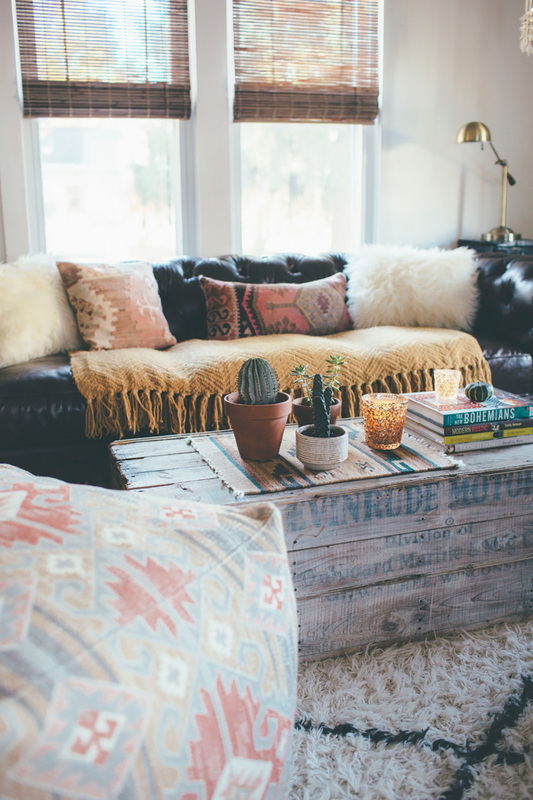 Hi Alice, love your blog and this coffee table. Can you tell me where you got it from? I too LOVE this. Where did you get your coffee table? It is perfect! Hi! I love the little mini rug(?) thing on top of your table. 🙂 Where did you get it??? Adorable – love it! 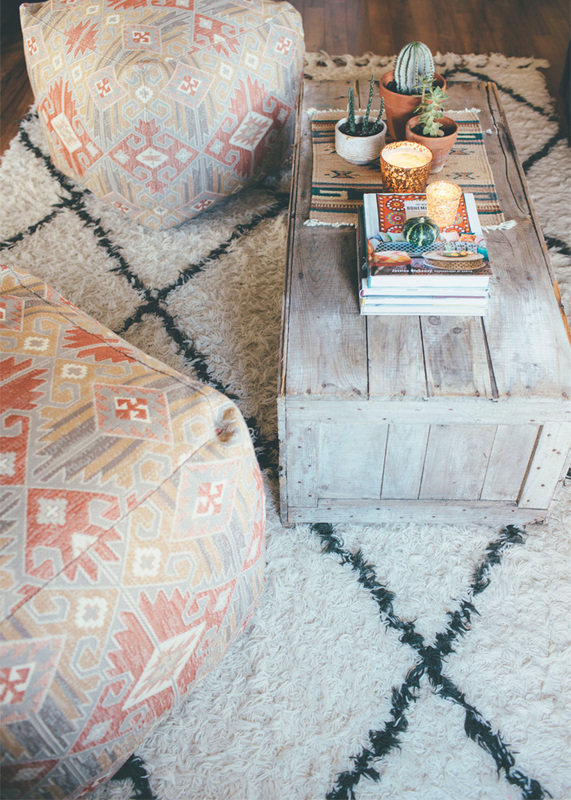 Can you tell us where you got your coffee table pretty please? Hi Alice! Where is your lovely couch from? I actually have a Jonathan Louis ottoman in that same fabric! I was thinking about getting a similar rug, but wasn't sure how the look together. This seals the deal, it looks great! Yes, I love them together! Thanks for visiting! Absolutely love you Space! I recently moved into a 500 sq. ft. place and the struggle is too real… we too have odd door placement, windows ann traffic patterns. I hate to be the dark cloud, but i recently purchased that same rug! Ours sheds so bad its almost unbearable, its beauty makes it tolerable. Did yours always have a shedding problem / does it still shed or did i get a lemon? As far as I know, most wool shag rugs do shed 🙁 ours still does a little but it hasn't been unbearable thankfully. This is beautiful! how do you order the ottomans? It's an old crate from an antique store.